The animation above, provided by the Met Office, shows a progression of waves on the polar front (where the yellow/green tropical air meets the blue polar air) over the course of a few days. You can see wave after wave growing and breaking. In Step 1.5 you explored why we get depressions and how they move warm air polewards. Now let’s break the wave’s lifecycle down so we can explore the weather that develops. In the four stages in Figure 1, the grey shading shows the region of continuous cloud cover. The red warm front and blue cold front denote the boundaries of the central wave of warm air – often called the warm sector. The occluded front (purple) occurs when the wave breaks, and the cold front catches up with the warm front. 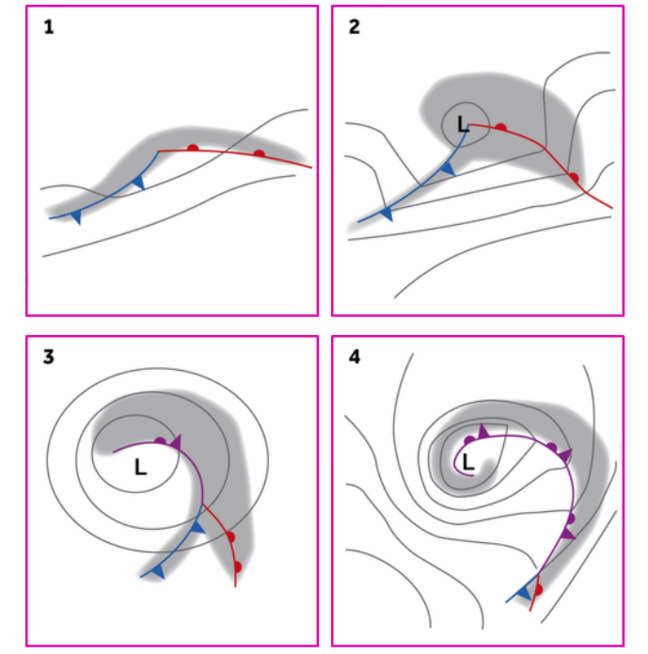 Cold fronts are marked with triangles (reminiscent of icicles) and warm fronts with semi-circles (reminiscent of the warm sun). Before we go into further detail, let’s take a step back and think about some basic physics. 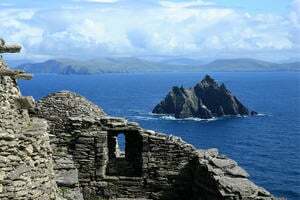 The first thing to remember is that warm air rises, and that warm air rising is called convection. Where P is pressure, V is volume and T is temperature. So, if the pressure falls, the gas must cool. 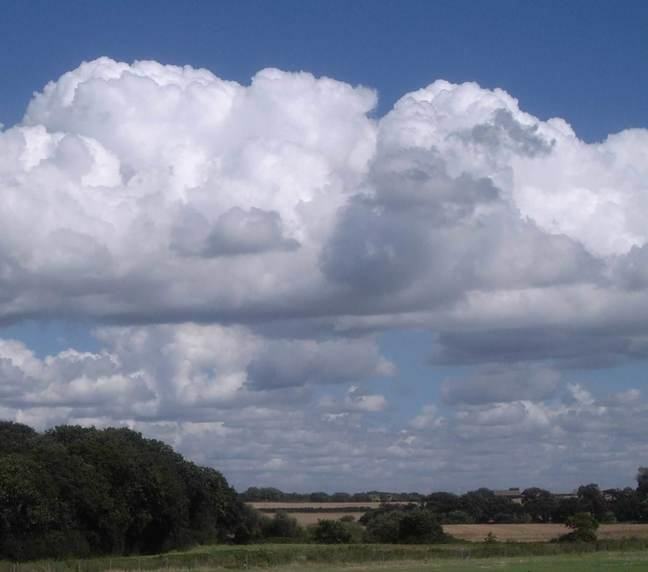 As the rising air cools, the rate of evaporation becomes less than the rate of condensation until eventually cloud droplets form. As water vapour condenses into liquid water, latent heat is released providing the energy source for the developing storm. And the latent heat generated is significant. For example, there is enough heat released in a small cumulus cloud to power an average home for 17 years. As the storm continues to develop, some of the cloud droplets will become large enough to fall as rain. So now, let’s look at a cross section through our developing depression (stage 2 in Figure 1) and see what’s going on in 3 dimensions. 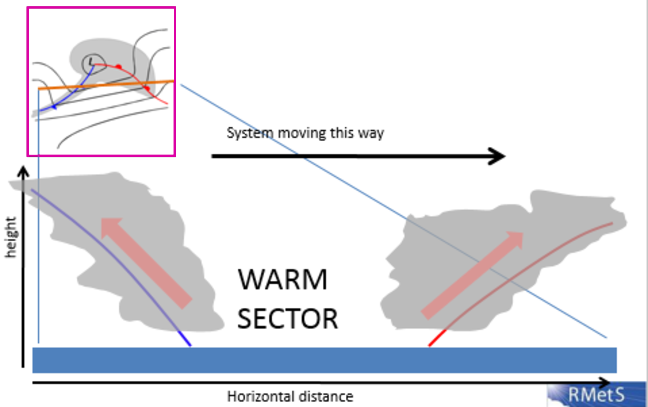 The cross section follows the brown line, going from the cold air behind the cold front, through the cold front, the warm air in the middle and the warm front and then into the cold air ahead of the depression. Remember that the depression is moving from west to east. As the cold air on the left pushes into the warm air ahead of it, the warm air has to rise, and the cold air pushes underneath it, giving a cold front which slopes backwards. At the same time, where the warm air meets the cold air ahead of it, the warm air rises up and over the cold air, giving a forwards facing warm front. In both places the air is rising, and this is where the cloud and rain are found.